State funding meeting the criteria laid down in Article 107(1) of the Treaty constitutes State aid and requires notification to the Commission by virtue of Article 108(3) thereof. However, pursuant to Article 109 of the Treaty, the Council may determine categories of aid that are exempted from this notification requirement. In accordance with Article 108(4) of the Treaty, the Commission may adopt regulations relating to those categories of aid. Regulation (EC) No 994/98 empowers the Commission to declare, in accordance with Article 109 of the Treaty, that certain categories of aid may, under certain conditions, be exempted from the notification requirement. On the basis of that Regulation, the Commission adopted Commission Regulation (EC) No 736/2008 (3) which provided that, under certain conditions, aid to small and medium-sized enterprises (‘SMEs’) active in the production, processing and marketing of fisheries products is compatible with the internal market and not subject to the notification requirement of Article 108(3) of the Treaty. Regulation (EC) No 736/2008 applied until 31 December 2013. The Commission has applied Articles 107 and 108 of the Treaty to SMEs active in the production, processing and marketing of fishery and aquaculture products in numerous decisions. It has also stated its policy in guidelines specific to that sector. In the light of the Commission's experience in applying those provisions to SMEs, it is appropriate for the Commission to continue making use of the powers conferred by Regulation (EC) No 994/98 in order to exempt aid to that category of undertakings from the notification requirement of Article 108(3) of the Treaty under certain conditions. On 22 July 2013 Regulation (EC) No 994/98 was amended by Council Regulation (EU) No 733/2013 (4) to empower the Commission to extend the block exemption to new categories of aid in respect of which clear compatibility conditions can be defined. In the fishery and aquaculture sector, this is the case for aid to make good the damage caused by certain natural disasters, in light of the Commission's experience in applying Article 107(2)(b) of the Treaty to this category of aid. The compatibility of State aid in the fishery and aquaculture sector is assessed by the Commission on the basis of the objectives of both the Competition Policy and the Common Fisheries Policy. In the interests of coherence with Union-financed support measures, the maximum intensity of public aid allowed under this Regulation should be equal to that fixed for the same kind of aid in Article 95 of Regulation (EU) No 508/2014 of the European Parliament and of the Council (5) and the implementing acts adopted pursuant to that Regulation. It is essential that no aid is granted in circumstances where Union law, and in particular rules of the Common Fisheries Policy, are not complied with. An aid may therefore only be granted by a Member State in the fishery and aquaculture sector if the measures financed and their effects comply with Union law. Member States should ensure that beneficiaries of State aid comply with the rules of the Common Fisheries Policy. With its Communication on EU State Aid Modernisation (SAM) (6), the Commission launched a wider review of the State aid rules. The main objectives of that modernisation are: (i) to achieve sustainable, smart and inclusive growth in a competitive internal market, while contributing to Member State efforts towards a more efficient use of public finances; (ii) to focus Commission ex ante scrutiny of aid measures on cases with the biggest impact on the internal market, while strengthening Member State cooperation in State aid enforcement; and (iii) to streamline the rules and provide for faster, better informed and more robust decisions based on a clear economic rationale, a common approach and clear obligations. This Regulation is part of the SAM programme. This Regulation should allow for better prioritisation of State aid enforcement activities and greater simplification and should enhance transparency, effective evaluation and the control of compliance with the State aid rules at national and Union levels, while preserving the institutional competences of the Commission and the Member States. In accordance with the principle of proportionality, this Regulation does not go beyond what is necessary in order to achieve those objectives. The general conditions for the application of this Regulation should be defined on the basis of a set of common principles that ensure that the aid serves a purpose of common interest, has a clear incentive effect, is appropriate and proportionate, is granted in full transparency and subject to a control mechanism and regular evaluation and does not adversely affect trading conditions to an extent that is contrary to the common interest. Aid that fulfils all the conditions laid down in this Regulation both general and specific to the relevant categories of aid should be considered compatible with the internal market and exempted from the notification requirement laid down in Article 108(3) of the Treaty. State aid within the meaning of Article 107(1) of the Treaty not covered by this Regulation or by other Regulations adopted pursuant to Article 1 of Regulation (EC) No 994/98 remains subject to the notification requirement of Article 108(3) of the Treaty. This Regulation is without prejudice for Member States to notify aid potentially covered by this Regulation. Such aid should be assessed in the light of the Guidelines for the examination of State aid in the fishery and aquaculture sector or any successor guidelines (7). This Regulation should not apply to aid contingent upon the use of domestic over imported products or aid to export-related activities. In particular, it should not apply to aid financing the establishment and operation of a distribution network in other Member States or third countries. Aid towards the cost of participating in trade fairs or of studies or consultancy services needed for the launch of a new or existing product on a new market in another Member State or third country should not normally constitute aid to export-related activities. The Commission should ensure that authorised aid does not adversely affect trading conditions to an extent that is contrary to the common interest. Therefore, aid in favour of a beneficiary which is subject to an outstanding recovery order following a previous Commission decision declaring an aid illegal and incompatible with the internal market should be excluded from the scope of this Regulation, with the exception of aid schemes to make good the damage caused by natural disasters. 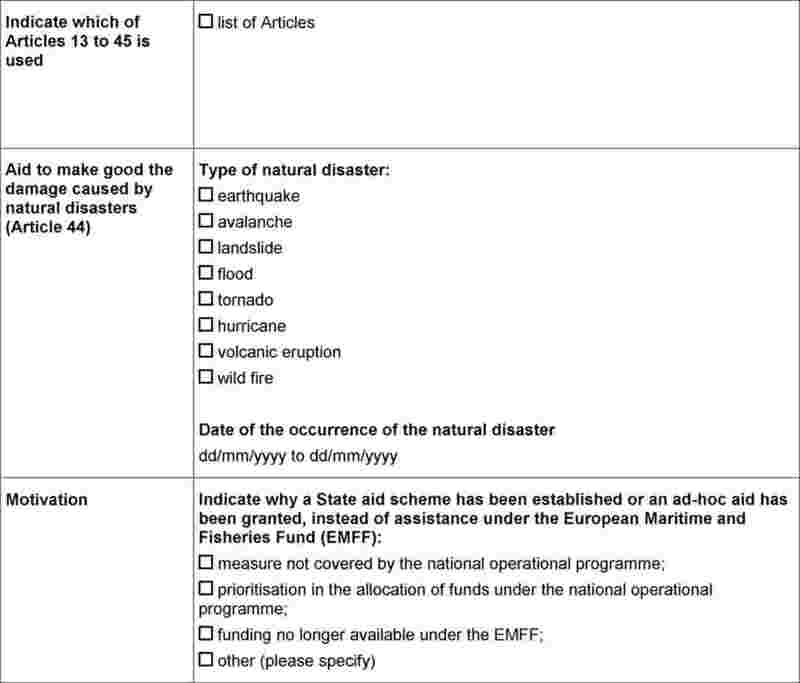 Aid granted to undertakings in difficulty should be excluded from the scope of this Regulation, since such aid should be assessed under the Guidelines on State aid for rescuing and restructuring non-financial undertakings in difficulty (8), in order to avoid their circumvention, with the exception of aid schemes to make good the damage caused by natural disasters. In order to provide legal certainty, it is appropriate to establish clear criteria that do not require an assessment of all the particularities of the situation of an undertaking to determine whether an undertaking is considered to be in difficulty for the purposes of this Regulation. State aid enforcement is highly dependent on the cooperation of Member States. Therefore, Member States should take all necessary measures to ensure compliance with this Regulation, including compliance of individual aid granted under block-exempted schemes. In view of the need to strike the appropriate balance between minimising distortions of competition in the aided sector and the objectives of this Regulation, this Regulation should not exempt individual grants which exceed a fixed maximum amount, whether or not made under an aid scheme exempted by this Regulation. For the purpose of transparency, equal treatment and effective monitoring, this Regulation should apply only to aid in respect of which it is possible to calculate precisely the gross grant equivalent ex ante without the need to undertake a risk assessment (‘transparent aid’). This Regulation should define the conditions under which certain specific aid instruments, such as loans, guarantees, tax measures, and, in particular, repayable advances may be considered transparent. Aid comprised in guarantees should be considered as transparent if the gross grant equivalent has been calculated on the basis of safe-harbour premiums laid down for the respective type of undertaking. In the case of SMEs, the Commission Notice on the application of Articles 87 and 88 of the EC Treaty to State aid in the form of guarantees (9) indicates levels of annual premium above which a State guarantee would be deemed not to constitute aid. For the purposes of this Regulation, capital injections and risk capital measures should not be considered transparent aid. In order to ensure that the aid is necessary and acts as an incentive to further develop activities or projects, this Regulation should not apply to aid for activities in which the beneficiary would in any case engage even in the absence of the aid. Aid should only be exempted from notification requirement of Article 108(3) of the Treaty in accordance with this Regulation, where the activity or the work on the aided project starts after the beneficiary has submitted a written application for the aid. Automatic aid schemes in the form of tax advantages should continue to be subject to a specific condition concerning the incentive effect, due to the fact that this kind of aid is granted under different procedures than other categories of aid. Such schemes should already have been adopted before work on the aided project or activity started. However, this condition should not apply in the case of fiscal successor schemes provided the activity was already covered by the previous fiscal schemes in the form of tax advantages. For the assessment of the incentive effect of such schemes, the crucial moment is the moment when the tax measure was set out for the first time in the original scheme, which is then replaced by the successor scheme. For the calculation of aid intensity, only eligible costs should be included. This Regulation should not exempt aid which exceeds the relevant aid intensity as a result of including ineligible costs. The identification of eligible costs should be supported by clear, specific and up-to date documentary evidence. All figures used should be taken before any deduction of tax or other charges. Aid payable in several instalments should be discounted to its value on the date of granting of the aid. The eligible costs should also be discounted to their value on the date of granting. The interest rate to be used for discounting purposes and for calculating the amount of aid in the case of aid which does not take the form of a grant should be respectively the discount rate and the reference rate applicable at the time of the grant, as laid down in the Commission Communication on the revision of the method for setting the reference and discount rates (10). Where aid is granted by means of tax advantages, aid tranches should be discounted on the basis of the discount rates applicable on the various dates when the tax advantages become effective. The use of aid in the form of repayable advances should be promoted, since such risk-sharing instruments are conducive to strengthened incentive effect of aid. It is therefore appropriate to establish that where aid is granted in the form of repayable advances the applicable aid intensities referred to in this Regulation may be increased. In the case of tax advantages on future taxes, the applicable discount rate and the exact amount of the aid tranches may not be known in advance. In such cases, Member States should set in advance a cap on the discounted value of the aid respecting the applicable aid intensity. Subsequently, when the amount of the aid tranche at a given date becomes known, discounting can take place on the basis of the discount rate applicable at that time. The discounted value of each aid tranche should be deducted from the overall amount of the cap (‘capped amount’). To determine whether the notification thresholds and the maximum aid intensities referred to in this Regulation are respected, the total amount of public support for the aided activity or project should be taken into account. Moreover, this Regulation should specify the circumstances under which different categories of aid may be cumulated. Aid exempted by this Regulation and any other compatible aid exempted under other regulations or approved by the Commission may be cumulated as long as those measures concern different identifiable eligible costs. Where different sources of aid are related to the same — partly or fully overlapping — identifiable eligible costs, cumulation should be allowed up to the highest aid intensity or aid amount applicable to that aid under this Regulation. This Regulation should also set out special rules for cumulation of aid measures with de minimis aid. De minimis aid is often not granted for or attributable to specific identifiable eligible costs. In such a case, it should be possible to freely cumulate de minimis aid with State aid exempted under this Regulation. Where, however, de minimis aid is granted for the same identifiable eligible costs as State aid exempted under this Regulation, cumulation should only be allowed up to the maximum aid intensity as referred to in Chapter III of this Regulation. Given that State aid within the meaning of Article 107(1) of the Treaty is, in principle, prohibited, it is important for all parties to be able to check whether an aid is granted in compliance with the applicable rules. Transparency of State aid is, therefore, essential for the correct application of Treaty rules and leads to better compliance, greater accountability, peer review and ultimately more effective public spending. To ensure transparency, Member States should be required to establish comprehensive State aid websites, at regional or national level, setting out summary information about each aid measure exempted under this Regulation. That obligation should be a condition for the compatibility of the individual aid with the internal market. Following the standard practice regarding publication of information in Directive 2013/37/EU of the European Parliament and of the Council (11), a standard format should be used which allows the information to be searched, downloaded and easily published on the Internet. The links to the State aid websites of all the Member States should be published on the Commission's website. In accordance with Article 3 of Regulation (EC) No 994/98, as amended by Regulation (EU) No 733/2013, summary information on each aid measure exempted under this Regulation should be published on the website of the Commission. To ensure effective monitoring of aid measures in accordance with Regulation (EC) No 994/98, as amended by Regulation (EU) No 733/2013, it is appropriate to establish requirements regarding the reporting by the Member States of aid measures which have been exempted pursuant to this Regulation and the application of this Regulation. Moreover, it is appropriate to establish rules concerning the records that Member States should keep regarding the aid exempted by this Regulation, in light of the limitation period established in Article 15 of Council Regulation (EC) No 659/1999 (12). Finally, each individual aid should contain an express reference to this Regulation. To reinforce the effectiveness of compatibility conditions set out in this Regulation, it should be possible for the Commission to withdraw the benefit of the block exemption for future aid measures in the event of failure to comply with these requirements. The Commission should be able to restrict the withdrawal of the benefit of the block exemption to certain types of aid, certain beneficiaries or aid measures adopted by certain authorities, where non-compliance with this Regulation affects only a limited group of measures or certain authorities. Such a targeted withdrawal should provide a proportionate remedy directly linked to the identified non-compliance with this Regulation. In case of failure to meet compatibility conditions set out in Chapters I and III, aid granted will not be covered by this Regulation and, as a consequence, will constitute unlawful aid, which the Commission will examine in the framework of the relevant procedure as set out in Regulation No (EC) No 659/1999. In case of failure to fulfil the requirements of Chapter II, the withdrawal of the benefit of the block exemption in respect of the future aid measures does not affect the fact that the past measures complying with this Regulation were block exempted. To eliminate differences that might give rise to distortions of competition and to facilitate coordination between different Union and national initiatives concerning SMEs, as well as for reasons of administrative clarity and legal certainty, the definition of SMEs used for the purpose of this Regulation should be based on the definition in Commission Recommendation 2003/361/EC (13). This Regulation should cover types of aid granted in the fishery and aquaculture sector which have been systematically approved by the Commission for many years. This aid should not require a case-by-case assessment of its compatibility with the internal market from the Commission, provided that it complies with the conditions laid down in Regulation (EU) No 508/2014. In accordance with Article 107(2)(b) of the Treaty, aid to make good the damage caused by natural disasters is compatible with the internal market. In order to provide legal certainty, it is necessary to define the type of the events that may constitute a natural disaster exempted by this Regulation. For the purposes of this Regulation, earthquakes, landslides, floods, in particular floods brought about by waters overflowing river banks or lake shores, avalanches, tornadoes, hurricanes, volcanic eruptions and wildfires of natural origin should be considered events constituting a natural disaster. Damage caused by adverse weather conditions such as storms, frost, hail, ice, rain or drought, which occur on a more regular basis, should not be considered a natural disaster within the meaning of Article 107(2)(b) of the Treaty. In order to ensure that the exemption covers indeed aid granted to make good the damage caused by natural disasters, this Regulation should lay down, following established practice, the conditions under which such aid schemes may benefit from that block exemption. Those conditions should relate, in particular, to the formal recognition by the competent Member States' authorities of the character of the event as a natural disaster and to a direct causal link between the natural disaster and the damages suffered by the beneficiary undertaking, which may include undertakings in difficulty, and should ensure that overcompensation is avoided. The compensation should not exceed what is necessary to enable the beneficiary to return to the situation prevailing before the disaster occurred. Pursuant to Article 15(1)(f) and Article 15(3) of Council Directive 2003/96/EC (14), Member States may introduce tax exemptions or reductions applicable to inland fishing and piscicultural works. It is therefore appropriate to continue exempting those measures from the notification requirement of Article 108(3) of the Treaty where the conditions provided under that Directive are fulfilled. Tax exemptions applicable to fishing within EU waters which Member States are to introduce pursuant to Article 14 (1)(c) of that Directive are not imputable to the State and therefore should not constitute State aid. In the light of the Commission's experience in this area, State aid policy should periodically be revised. The period of application of this Regulation should therefore be limited and transitional provisions should be laid down. Having regard to the fact that the conditions for granting aid under this Regulation have been aligned with the conditions established for the application of Regulation (EU) No 508/2014 (15), it is appropriate to ensure consistency between the period of application of this Regulation and the period of application of Regulation (EU) No 508/2014. Should this Regulation expire without being extended, aid schemes already exempted by this Regulation should continue to be exempted for six months. 1. This Regulation shall apply to aid granted to small and medium-sized enterprises (SMEs) active in the production, processing or marketing of fishery and aquaculture products. 2. This Regulation shall also apply to aid granted to undertakings active in the production, processing or marketing of fishery and aquaculture products to make good the damage caused by natural disasters in accordance with Article 44 independently of the size of the beneficiary of the aid. aid granted to undertakings that cannot apply for support from the European Maritime and Fisheries Fund on the grounds set out in Article 10(1)-(3) of Regulation (EU) No 508/2014. aid restricting the possibility for the beneficiaries to exploit the research, development and innovation results in other Member States. 1. This Regulation shall not apply to aid for any project with eligible costs in excess of EUR 2 million, or where the amount of aid exceeds EUR 1 million per beneficiary per year. 2. The thresholds set out in paragraph 1 shall not be circumvented by artificially splitting up the aid schemes or aid projects. 1. 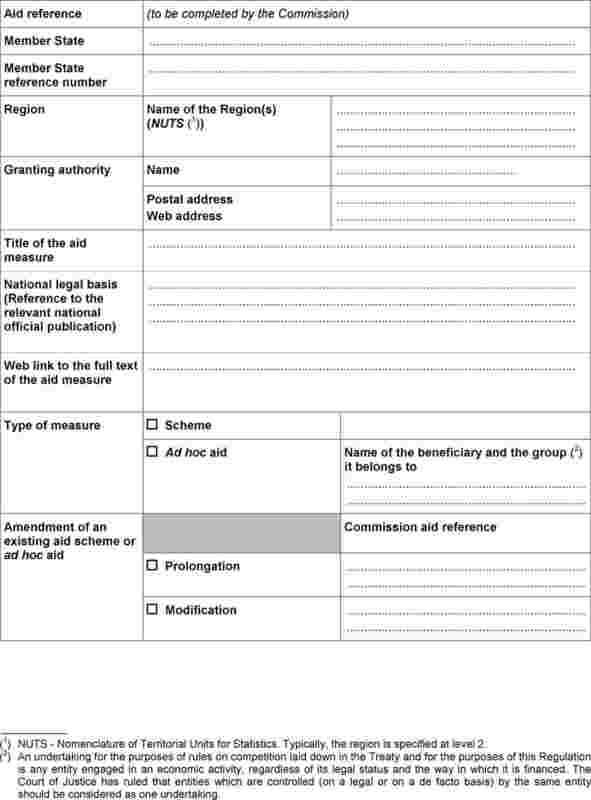 Aid schemes, individual aid granted under aid schemes and ad hoc aid shall be compatible with the internal market within the meaning of Article 107(2) or (3) of the Treaty and shall be exempted from the notification requirement of Article 108(3) of the Treaty provided that such aid fulfils the conditions laid down in Chapter I of this Regulation, as well as the specific conditions for the relevant category of aid laid down in Chapter III of this Regulation. 2. Aid measures shall only be exempted under this Regulation as far as they explicitly provide that, during the grant period, the beneficiaries of the aid shall comply with the rules of the Common Fisheries Policy and that, if during that period it is found that the beneficiary does not comply with rules of the Common Fisheries Policy, the aid shall be reimbursed in proportion to the gravity of the infringement. 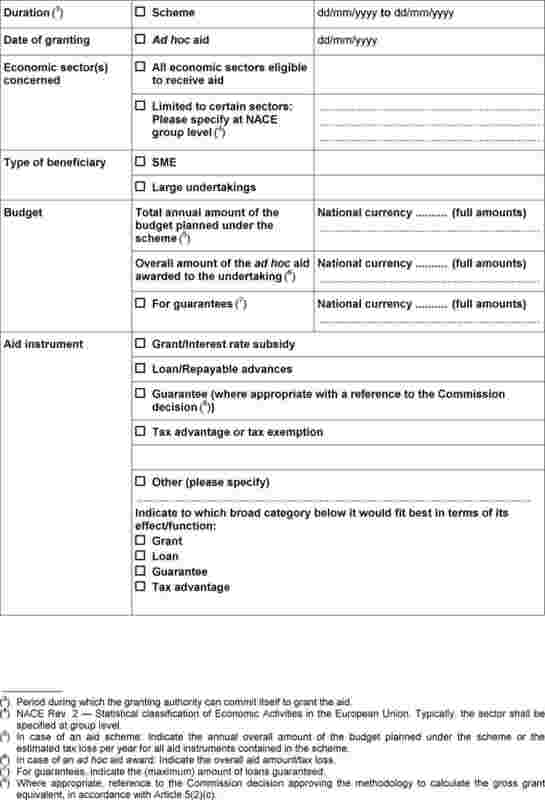 aid in the form of repayable advances, if the total nominal amount of the repayable advance does not exceed the thresholds applicable under this Regulation or if, before implementation of the measure, the methodology to calculate the gross grant equivalent of the repayable advance has been accepted following its notification to the Commission. aid comprised in risk finance measures. 1. This Regulation shall apply only to aid which has an incentive effect. type of aid (grant, loan, guarantee, repayable advance or other) and amount of public funding needed for the project or activity. the measure has been adopted and is in force before work on the aided project or activity has started, except in the case of fiscal successor schemes where the activity was already covered by the previous schemes in the form of tax advantages. aid in the form of tax exemptions or reductions adopted by the Member States pursuant to Article 15(1)(f) and Article 15(3) of Directive 2003/96/EC, if the conditions laid down in Article 45 of this Regulation are fulfilled. 1. For the purpose of calculating aid intensity and eligible costs, all figures used shall be taken before any deduction of tax or other charge. The eligible costs shall be supported by documentary evidence which shall be clear, specific and contemporary. 2. Where aid is granted in a form other than a grant, the aid amount shall be the gross grant equivalent of the aid. 3. Aid payable in several instalments shall be discounted to its value on the date of granting the aid. The eligible costs shall be discounted to their value on the date of granting the aid. The interest rate to be used for discounting purposes shall be the discount rate applicable on the date of granting the aid. 4. Where aid is granted by means of tax advantages discounting of aid tranches shall take place on the basis of the discount rates applicable on the various dates when the tax advantage takes effect. 5. Where aid is granted in the form of repayable advances which, in the absence of an accepted methodology to calculate their gross grant equivalent, are expressed as a percentage of the eligible costs and the measure provides that in case of a successful outcome of the project, as defined on the basis of a reasonable and prudent hypothesis, the advances will be repaid with an interest rate at least equal to the discount rate applicable on the date of granting the aid, the maximum aid intensities laid down in Chapter III may be increased by 10 percentage points. 6. The eligible costs shall comply with the requirements of Articles 67 to 69 of Regulation (EU) No 1303/2013 of the European Parliament and of the Council (19). 1. In determining whether the notification thresholds in Article 2 and the maximum aid intensities in Chapter III are respected, the total amount of public support measures for the aided activity or project or undertaking shall be taken into account, regardless of whether that support is financed from local, regional, national or Union sources. any other State aid, in relation to the same eligible costs, partly or fully overlapping, only if such cumulation does not result in exceeding the highest aid intensity or aid amount applicable to this aid under this Regulation. 3. State aid exempted under this Regulation shall not be cumulated with any de minimis aid in respect of the same eligible costs if such cumulation would result in an aid intensity exceeding those referred to in Chapter III. the information referred to in Annex III on each individual aid award exceeding EUR 30 000. 3. The information referred to in paragraph 1(c) shall be organised and accessible in a standardised manner, as described in Annex III, and shall allow for effective search and download functions. The information referred to in paragraph 1 shall be published within six months from the date the aid was granted, or for aid in the form of tax advantage, within one year from the date the tax declaration is due, and shall be available for at least 10 years from the date on which the aid was granted. 4. Each aid scheme and individual aid shall contain an explicit reference to this Regulation, by citing its title and publication reference in the Official Journal of the European Union, and to the specific provisions of Chapter III concerned by that act, or where applicable, to the national law which ensures that the relevant provisions of this Regulation are complied with. It shall be accompanied by its implementing provisions and its amendments. the summary information referred to in Article 11. 6. Member States shall comply with the provisions of this Article at the latest within two years after the entry into force of this Regulation. Where a Member State grants aid allegedly exempted from the notification requirement under this Regulation without fulfilling the conditions set out in Chapters I, II and III, the Commission may, after having provided the Member State concerned with the possibility to make its views known, adopt a decision stating that all or some of the future aid measures adopted by the Member State concerned which would otherwise fulfil the requirements of this Regulation, are to be notified to the Commission in accordance with Article 108(3) of the Treaty. The measures to be notified may be limited to measures granting certain types of aid, in favour of certain beneficiaries or adopted by certain authorities of the Member State concerned. an annual report, as referred to in Commission Regulation (EC) No 794/2004 (20), in electronic form, on the application of this Regulation, containing the information indicated in Regulation (EC) No 794/2004, in respect of each whole year or each part of the year during which this Regulation applies. In order to enable the Commission to monitor the aid exempted from notification by this Regulation, Member States shall maintain detailed records with the information and supporting documentation necessary to establish that all the conditions laid down in this Regulation are fulfilled. Such records shall be kept for 10 years from the date on which the ad hoc aid was granted or the last aid was granted under the scheme. The Member State concerned shall provide the Commission within a period of 20 working days or such longer period as may be fixed in the request, with all the information and supporting documentation which the Commission considers necessary to monitor the application of this Regulation. the amount of the aid does not exceed, in gross grant equivalent, the maximum intensity of public aid fixed by Article 95 of Regulation (EU) No 508/2014 and the implementing acts adopted on the basis of Article 95(5) of that Regulation. 1. Aid schemes to make good the damage caused by natural disasters shall be compatible with the internal market within the meaning of Article 107(2)(b) of the Treaty and shall be exempted from the notification requirement of Article 108(3) thereof where it fulfils the conditions laid down in this Article and in Chapter I.
there is a direct causal link between the natural disaster and the damage suffered by the undertaking. 3. Aid shall be paid directly to the undertaking concerned. 4. Aid schemes related to a specific natural disaster shall be established within three years from the date of the occurrence of the natural disaster. The aid shall be paid out within four years from that date. loss of income due to the full or partial suspension of activity for a period not exceeding six months from the occurrence of the disaster. 6. The calculation of the material damage shall be based on the repair cost or economic value of the affected asset before the disaster. It shall not exceed the repair cost or the decrease in fair market value caused by the disaster, namely the difference between the property's value immediately before and immediately after the disaster. the result of multiplying the average annual quantity of fishery and aquaculture products produced in the three-year period preceding the natural disaster, or a three year average based on the five-year period preceding the natural disaster, excluding the highest and lowest entry, by the average selling price obtained. 8. The damage shall be calculated at the level of the individual beneficiary. 9. The aid and any other payments received to compensate the damage, including payments under insurance policies, shall be limited to 100 % of the eligible costs. 1. Aid in the form of tax exemptions or reductions adopted by the Member States pursuant to Article 15(1)(f) and Article 15(3) of Directive 2003/96/EC shall be compatible with the internal market within the meaning of Article 107(3)(c) and exempt from the notification requirement of Article 108(3) of the Treaty, provided that the conditions laid down in Directive 2003/96/EC and in Chapter I of this Regulation are fulfilled. 2. The beneficiaries of the tax exemptions or reductions shall be selected on the basis of transparent and objective criteria. Where applicable, they shall pay at least the respective minimum level of taxation set by Directive 2003/96/EC. 1. This Regulation shall apply to individual aid granted before its entry into force, if the aid fulfils all the conditions laid down in this Regulation, with the exception of Article 9. 2. Any aid granted before 1 July 2014 by virtue of any regulation adopted pursuant to Article 1 of Regulation (EC) No 994/98 previously in force shall be compatible with the internal market and exempted from the notification requirement of Article 108(3) of the Treaty. 3. Any aid not exempted from the notification requirement of Article 108(3) of the Treaty by virtue of this Regulation or other regulations adopted pursuant to Article 1 of Regulation (EC) No 994/98 previously in force shall be assessed by the Commission in accordance with the relevant frameworks, guidelines, communications and notices. 4. At the end of the period of validity of this Regulation any aid schemes exempted under this Regulation shall remain exempted during an adjustment period of six months. This Regulation shall enter into force on 1 January 2015. Done at Brussels, 16 December 2014. (1) Council Regulation (EC) No 994/98 of 7 May 1998 on the application of Articles 107 and 108 of the Treaty on the Functioning of the European Union to certain categories of horizontal State aid (OJ L 142, 14.5.1998, p. 1.). (2) OJ C 258, 8.8.2014, p. 1. (3) Commission Regulation (EC) No 736/2008 of 22 July 2008 on the application of Articles 87 and 88 of the Treaty to State aid to small and medium-sized enterprises active in the production, processing and marketing of fisheries products (OJ L 201, 30.7.2008, p. 16). (4) Council Regulation (EU) No 733/2013 of 22 July 2013 amending Regulation (EC) No 994/98 on the application of Articles 92 and 93 of the Treaty establishing the European Community to certain categories of horizontal State aid (OJ L 204, 31.7.2013, p. 11). (5) Regulation (EU) No 508/2014 of the European Parliament and of the Council of 15 May 2014 on the European Maritime and Fisheries Fund and repealing Council Regulations (EC) No 2328/2003, (EC) No 861/2006, (EC) No 1198/2006 and (EC) No 791/2007 and Regulation (EU) No 1255/2011 of the European Parliament and of the Council (OJ L 149, 20.5.2014, p. 1). (7) OJ C 84, 3.4.2008, p. 10. (8) OJ C 249, 31.7.2014, p. 1. (9) OJ C 155, 20.6.2008, p. 10. (10) OJ C 14, 19.1.2008, p. 6. (11) Directive 2013/37/EU of the European Parliament and of the Council of 26 June 2013 amending Directive 2003/98/EC on the re-use of public sector information (OJ L 175, 27.6.2013, p. 1). (12) Council Regulation (EC) No 659/1999 of 22 March 1999 laying down detailed rules for the application of Article 93 of the EC Treaty (OJ L 83, 27.3.1999, p. 1). (13) Commission Recommendation 2003/361/EC of 6 May 2003 concerning the definition of micro, small and medium sized enterprises (OJ L 124, 20.5.2003, p. 36). (14) Council Directive 2003/96/EC of 27 October 2003 restructuring the Community framework for the taxation of energy products and electricity (OJ L 283, 31.10.2003, p. 51). (15) Regulation (EU) No 508/2014 of the European Parliament and of the Council of 15 May 2014 on the European Maritime and Fisheries Fund and repealing Council Regulations (EC) No 2328/2003, (EC) No 861/2006, (EC) No 1198/2006 and (EC) No 791/2007 and Regulation (EU) No 1255/2011 of the European Parliament and of the Council (OJ L 149, 20.5.2014, p. 1). (16) Regulation (EU) No 1379/2013 of the European Parliament and of the Council of 11 December 2013 on the common organisation of the markets in fishery and aquaculture products, amending Council Regulations (EC) No 1184/2006 and (EC) No 1224/2009 and repealing Council Regulation (EC) No 104/2000 (OJ L 354, 28.12.2013, p. 1). (17) Directive 2013/34/EU of the European Parliament and of the Council of 26 June 2013 on the annual financial statements, consolidated financial statements and related reports of certain types of undertakings, amending Directive 2006/43/EC of the European Parliament and of the Council and repealing Council Directives 78/660/EEC and 83/349/EEC (OJ L 182, 29.6.2013, p. 19). (18) OJ C 155, 20.6.2008, p. 10. (19) Regulation (EU) No 1303/2013 of the European Parliament and of the Council of 17 December 2013 laying down common provisions on the European Regional Development Fund, the European Social Fund, the Cohesion Fund, the European Agricultural Fund for Rural Development and the European Maritime and Fisheries Fund and laying down general provisions on the European Regional Development Fund, the European Social Fund, the Cohesion Fund and the European Maritime and Fisheries Fund and repealing Council Regulation (EC) No 1083/2006 (OJ L 347, 20.12.2013, p. 320). (20) Commission Regulation (EC) No 794/2004 of 21 April 2004 implementing Council Regulation (EC) No 659/1999 laying down detailed rules for the application of Article 93 of the EC Treaty (OJ L 140, 30.4.2004, p. 1). An enterprise is considered to be any entity engaged in an economic activity, irrespective of its legal form. This includes, in particular, self-employed persons and family businesses engaged in craft or other activities, and partnerships or associations regularly engaged in an economic activity. 1. The category of micro, small and medium-sized enterprises (‘SMEs’) is made up of enterprises which employ fewer than 250 persons and which have an annual turnover not exceeding EUR 50 million, and/or an annual balance sheet total not exceeding EUR 43 million. 2. Within the SME category, a small enterprise is defined as an enterprise which employs fewer than 50 persons and whose annual turnover and/or annual balance sheet total does not exceed EUR 10 million. 1. An ‘autonomous enterprise’ is any enterprise which is not classified as a partner enterprise within the meaning of paragraph 2 or as a linked enterprise within the meaning of paragraph 3. 2. ‘Partner enterprises’ are all enterprises which are not classified as linked enterprises within the meaning of paragraph 3 and between which there is the following relationship: an enterprise (upstream enterprise) holds, either solely or jointly with one or more linked enterprises within the meaning of paragraph 3, 25 % or more of the capital or voting rights of another enterprise (downstream enterprise). autonomous local authorities with an annual budget of less than EUR 10 million and less than 5 000 inhabitants. an enterprise, which is a shareholder in or member of another enterprise, controls alone, pursuant to an agreement with other shareholders in or members of that enterprise, a majority of shareholders' or members' voting rights in that enterprise. There is a presumption that no dominant influence exists if the investors listed in the second subparagraph of paragraph 2 are not involving themselves directly or indirectly in the management of the enterprise in question, without prejudice to their rights as shareholders. An ‘adjacent market’ is considered to be the market for a product or service situated directly upstream or downstream of the relevant market. 4. Except in the cases set out in paragraph 2, second subparagraph, an enterprise cannot be considered an SME if 5 % or more of the capital or voting rights are directly or indirectly controlled, jointly or individually, by one or more public bodies. 5. Enterprises may make a declaration of status as an autonomous enterprise, partner enterprise or linked enterprise, including the data regarding the thresholds set out in Article 2. The declaration may be made even if the capital is spread in such a way that it is not possible to determine exactly by whom it is held, in which case the enterprise may declare in good faith that it can legitimately presume that it is not owned as to 25 % or more by one enterprise or jointly by enterprises linked to one another. Such declarations are made without prejudice to the checks and investigations provided for by national or Union rules. 2. Where, at the date of closure of the accounts, an enterprise finds that, on an annual basis, it has exceeded or fallen below the headcount or financial thresholds stated in Article 2, this will not result in the loss or acquisition of the status of medium-sized, small or micro-enterprise unless those thresholds are exceeded over two consecutive accounting periods. partners engaging in a regular activity in the enterprise and benefiting from financial advantages from the enterprise. Member States shall organise their comprehensive State aid websites, on which the information referred to in Article 9(1) is to be published, in a way to allow easy access to the information. Information shall be published in a spreadsheet data format, which allows data to be searched, extracted and easily published on the Internet, for instance in CSV or XML format. Access to the website shall be allowed to any interested party without restrictions. No prior user registration shall be required to access the website. (1) NUTS — Nomenclature of Territorial Units for Statistics. Typically, the region is specified at level 2. (2) Council Regulation (EEC) No 3037/90 of 9 October 1990 on the statistical classification of economic activities in the European Community (OJ L 293, 24.10.1990, p. 1). (3) Gross grant equivalent. For fiscal schemes, this amount can be provided by the ranges set out in Article 9(2). (4) If the aid is granted through multiple aid instruments, the aid amount shall be provided by instrument.